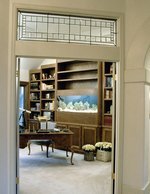 Aquariums are a great way to incorporate a bit of marine life into your home or office decor. They do require a fair amount of regular maintenance and attention. The Whisper Power Filter, manufactured by Tetra, incorporates the functioning of a mechanical filter, a biological filter and a chemical filter into one small mechanism that operates in silence. It eliminates the need for regular spot cleaning and installs in just a few steps. Snap the filter cartridge into the Whisper unit. Ensure that the foam grid faces the front of the filter. Suspend the filter over the inside of the tank while pushing the suction cup firmly against the glass to ensure a good seal. Arrange the power cord so that it rests over the wall of the tank. Add gravel up to an inch below the bottom of the filter. Fill the tank with water to within an inch of where the filter lip rests. Plug the unit into a power outlet and turn it on.